Zynga has filed a lawsuit for copyright infringement against the Brazilian company Vostu claiming MegaCity is just like CityVille. Social games maven Zynga is not above aping game mechanics - looking at you Mafia Wars - but it will apparently not suffer such injustice for its own titles. CityVille debuted in December last year as an extension of the Ville family of time-wasters from Zynga and it did pretty well out of the gate - grabbing 100k users on launch day. In April 2011, a Brazilian company called Vostu launched a game called MegaCity with a UI that is almost identical to Zynga's game. Vostu has also released other games that mimic PetVille, CafeWorld and even Zynga Poker. 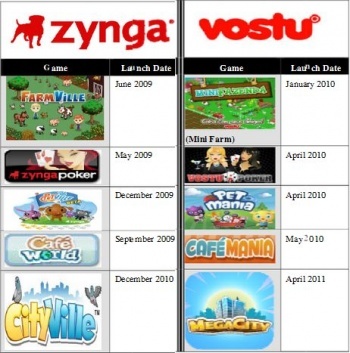 In response, Zynga has drawn a line in the sand by slapping Vostu with a lawsuit saying, "Get off my farm." Vostu's fired back by claiming that Zynga has made its millions by copying games, why can't they? "Let's be clear - it is one thing to be inspired by Zynga games, but it is entirely different to copy all of our key product features, product strategy, branding, mission statement and employee benefits lock, stock and barrel. We welcome Vostu into the arena of social games, but blatant infringement of our creative works is not an acceptable business strategy - it is a violation of the law," said Zynga's lawyer Reggie Davis. The allegations are pretty clear. Vostu not only copied the UI, mechanics and artwork of Zynga's games, but even the bugs. "Remarkably, Vostu's copying includes 'mistakes' in Zynga's games. For example, in CityVille, the Zynga developers forgot to add the requirement that Community Buildings be connected to a road in order to function within the game - a requirement for all other buildings in the game. The game was released without that requirement, and the bug was never fixed in Zynga's game. Vostu's MegaCity replicated this "mistake,'" Davis continued. Given the overwhelming evidence, did Vostu roll over and try to settle this suit out of court? Nope. They played the Chewbacca Defense. "Zynga has been accused of copying so many games that they've sadly lost the ability to recognize games like ours that are chock full of original content and have been independently created," spokesman Davidson Goldin said on behalf of Vostu. "Vostu has 500 brilliant employees working night and day making hand drawings and writing proprietary code for online games that our 35 million users worldwide enjoy. Zynga's anti-competitive effort to bully us with a frivolous lawsuit - especially when we have some of the same key investors - is pathetic. While Zynga plays games with the legal process we will continue focusing on using our substantial resources to create games that entertain our customers." Zang. That's a bold statement, considering that even a monkey would agree the games are pretty damn similar. Vostu has been able to raise almost $50 million in capital to fund its wholesale theft from Zynga's library, my guess is that most of that will be gone if they choose to fight a losing cause.